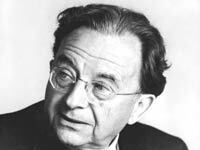 Erich Fromm was born to two Orthodox Jewish parents on March 23, 1900. He was born in Germany and lived there during most of his childhood. He had no brothers or sisters and was raised with heavy Jewish values. He attended the University of Frankfurt am Main in 1918 and then attended the University of Heidelberg in 1919. He studied sociology and soon received his Ph.D. in the subject when he graduated in 1922. After graduating from college, Fromm trained to become a psychoanalyst, which eventually led to him opening a practice in 1927. Three years later, Fromm was able to join the Institute for Social Research in Frankfurt, which allowed him to finish the psychoanalytical training he had started during the 1920s. In 1934, John moved to New York to become part of the Neo-Freudian school of psychoanalytical thought at Columbia University. He was in this school with Karen Horney and Harry Stack Sullivan, both of whom had studied similarly to Fromm. He and Horney soon started a relationship, but that came to a halt in the late 1930s. Fromm moved to the Washington School of Psychiatry in 1943 and opened the William Alanson White Institute of Psychiatry, Psychoanalysis and Psychology with other colleagues a few years later. During this time, Fromm was also a faculty member of Bennington College, but he left when he moved to Mexico City in 1949. After moving, he was named a professor at UNAM, which is where he created a psychoanalytic section at the medical school on campus. After this, Fromm moved to Michigan where he was a professor of Psychology at Michigan State University. He worked there from 1957 to 1961, which is when he moved to New York University to work as the professor of psychology. Fromm continued to teach at this same university until he retired in 1965, but then decided to teach again. His next job was at the Mexican Society of Psychoanalysis, which is where he worked until 1974. Erich Fromm wrote several different books, though many of them were written in German. He also wrote some books in English. Some of his most well-known publications include The Art of Loving (1956), May Man Prevail (1961), and The Nature of Man (1968). Fromm’s books touched on many different social and political philosophies. Some were more volatile than others and received a lot of feedback that was both good and bad. He argued different sides and spoke his mind about what he believed in. This caused him to face a lot of criticism from other philosophers as well as activists. Fromm owned a clinical practice throughout most of his life and kept it in business until his death in 1980. He died in his Switzerland home five days before his birthday, making him 79 years old at his death.